Don't have a use for these any more. $25 plus shipping sound good? Is that a sticker on the right one? If thatfntjing is not interested I am. That's a great deal sir. If you're not going to use those, what are you going to use instead? Just curious. Great price for somebody !! Damon23 wrote: If thatfntjing is not interested I am. 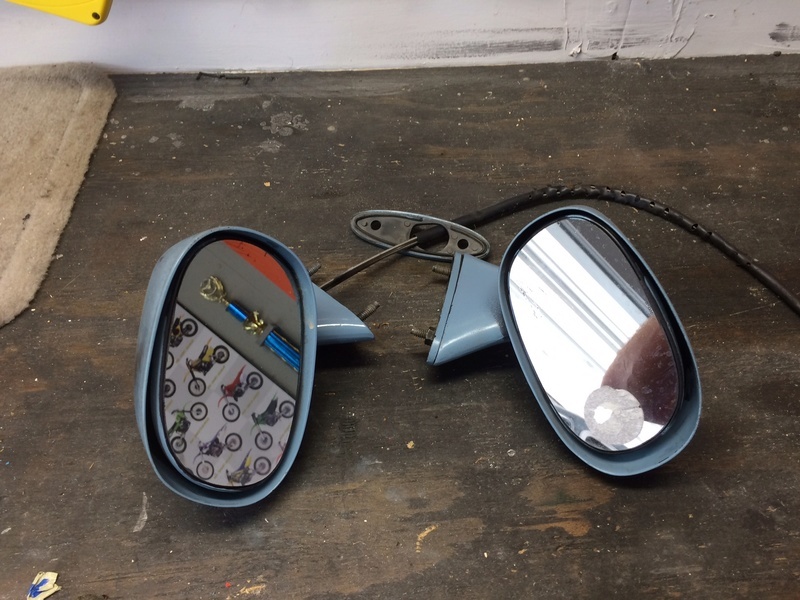 I was toying with the idea of making another set of electric mirrors out of them and reselling, but I really have more than enough projects right now. If you need 'em, go for it. Ok, then I'll take them. Sold to Damon23. And yes, that is residue on the right mirror from the back of a stick-on blind spot mirror. I located an original style chrome rectangular mirror and put that on my door, thus my reason for selling these. Have you by any chance posted info about electric mirror conversion? I'd be pretty interested in trying that. o The only G3 things to keep are the actual mirror housing and the mirror itself (with the black plastic mount plate the mirror is glued to). All the mechanicals hit the trash. o For the passenger mirror you'll have to drill about a 3/8" hole through the pedestal into the mirror housing, and again in the door itself for the wiring to go through. The drivers side will already have these for the old remote cable. 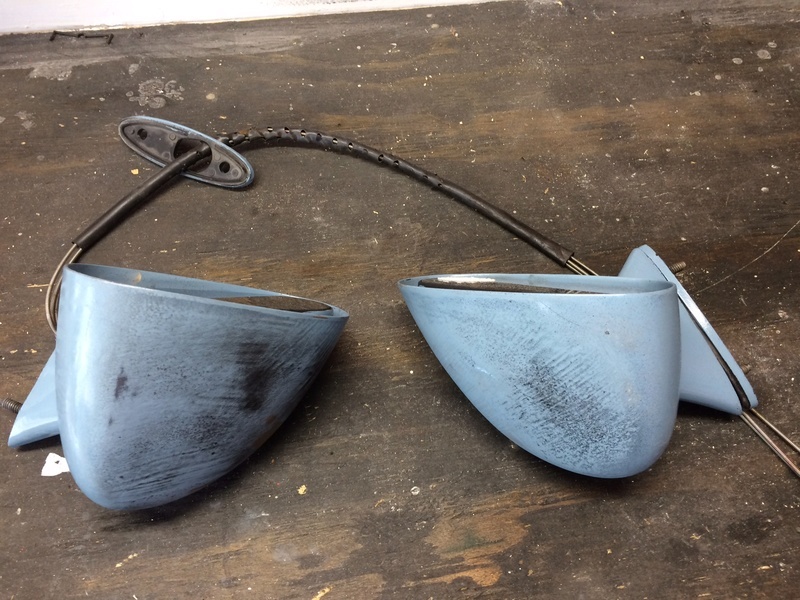 o You'll need to pick up a pair of '98 LeSabre power mirrors off ebay and cut away the plastic housing carefully so you are left with just the mirror motors and their flat mounting plate. These are just the right size to fit in our sport mirrors, though the mirror mount plate will need some slight flattening on the top and bottom IIRC. o A homemade steel L bracket will have the motor bolted to it, and there's a lot of trial-and-error fitting here to get the thing oriented right in the housing so the G3 mirror will be positioned correctly. Once it's right, the wiring gets fed through, and the bracket/motor assembly gets JB welded in place inside the mirror housing. The G3 mirror (with some trimming to the back of the plastic plate IIRC) can be made to snap onto the motor mount plate. o For a control, I used a 98-02 Camaro mirror switch, which will fit inside our existing door escutcheon almost perfectly. It will be too tall to put the retaining clip back, but will actually be held in place by the door sheet metal when you put the door trim back. If you (or anybody else reading this) wants to take a run at it, I can provide the pretty simple wiring diagram, and you can tap it into a spare port on your fuse box. Or just about any circuit, as it's a super low current draw. FWIW, I used the non-heated mirrors since the car never sees winter. It works great, but if I did another one I would add some JB weld to the top of the bracket as well (only did the bottom) to eliminate the little bit of vibration it gets when standing at idle in gear. Hope that helps, let me know of any Q. If anyone needs to see it in action, I'll take a video with my phone and see how I can post it here. Thank you very much. The mirrors are so small that I want to adjust them often, depending on what type of driving I'm doing (on highway or in town). I will put this in my project cue. Since it involves wiring, maybe I can do it when I change out my dash--soon I hope. I do not have an electrical in my doors now so I will also have to drill the end of the door and find a boot. crice63 wrote: Thank you very much. The mirrors are so small that I want to adjust them often, depending on what type of driving I'm doing (on highway or in town). I will put this in my project cue. Since it involves wiring, maybe I can do it when I change out my dash--soon I hope. 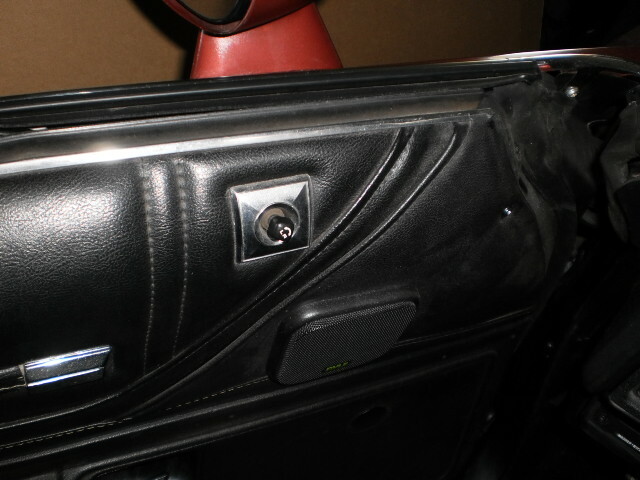 I do not have an electrical in my doors now so I will also have to drill the end of the door and find a boot. Where did you place the control for the passenger mirror? I was thinking about trying to find a switchable one so one control could be used for both mirrors. It's the same control. You twist it CW/CCW to switch mirrors. Perfect. It looks like it matches very well. Good video--I'm hooked. Yep, looks factory, which was the goal. Apologies to dhw3971 -- I did not mean to threadjack. love the power mirror solution thatfnthing. Thanks for sharing it. That is just too cool thatfnthing. Thanks for sharing. I guess I know what one of my winter projects is going to be. Thanks, guys! Always happy to help/inspire/kibitz. If anyone's going to try it, PM me for the wiring diagram. 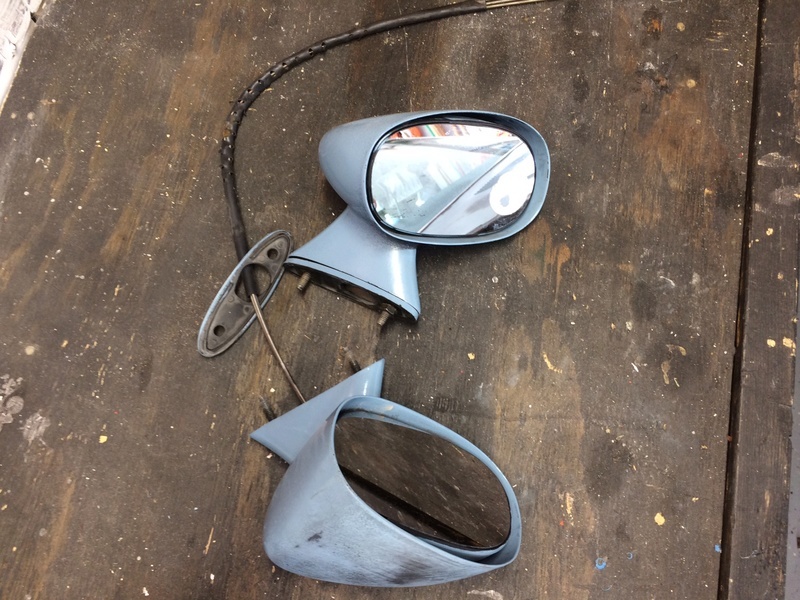 I'll hazard a guess that ebay's about to have a mysterious uptick in sales of 98 LeSabre mirrors. I just looked on car-part.com and found loads of them in my part of the country ranging from $20-50 a piece. 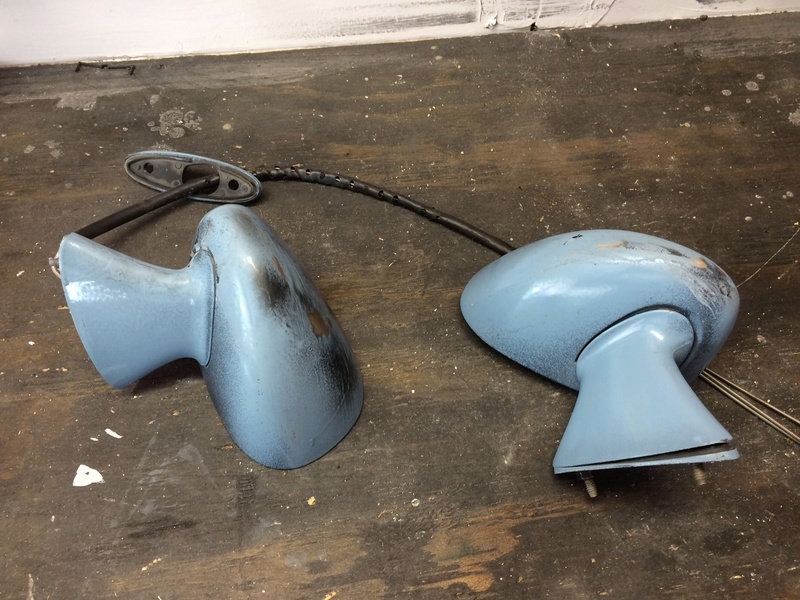 Might check your local yards before looking on E-bay. Just my two cents. The mirrors came yesterday. Great packing and fast shipping. Can't beat that. huzzah! good to hear they arrived safely. » Accepted Teams in sport Source Showcase?